January 1st, 2011- I wrote a silly blog post about my New Year’s food resolutions. Included in this was an item about how I was going to eat an entire pig in 2011. Truth be told, I was a bit hungover and on an “eat the offal” kick. Little did I know that this one blog post would be the one that you people on the interweb would latch on to. Nobody cares about resolutions one and two (to eat less fast food and to learn Indian cooking). 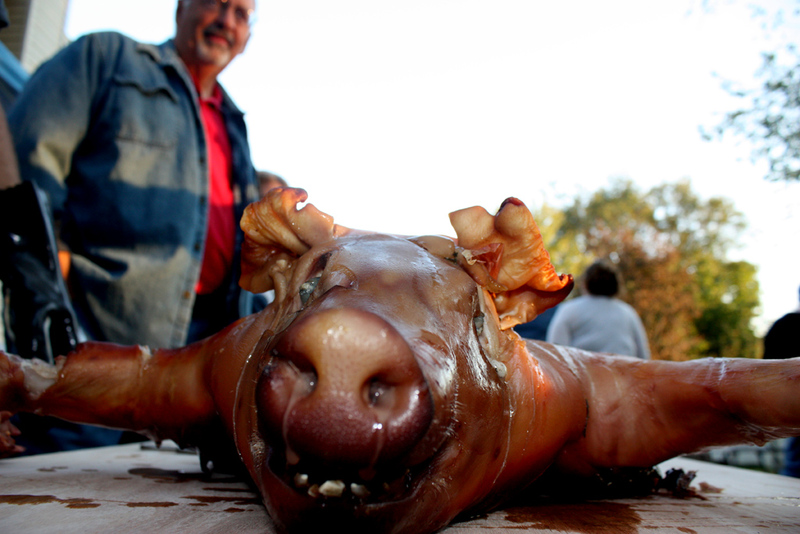 No, you, dear readers, want to read about a man’s quest to eat every little bit of a pig. I never intended to be the guy that writes about his love affair with pork, but if the hoof fits I’ll gladly eat it for your entertainment. Getting the coals going. Thanks to @anferno for the photos. A few weeks later, I got a call from my cousin, @mikeypiro. Not only had I inspired him to start a blog (which is one of the things I’m most proud of in 2011, by the way. The blog is awesome! Keep up the great work! 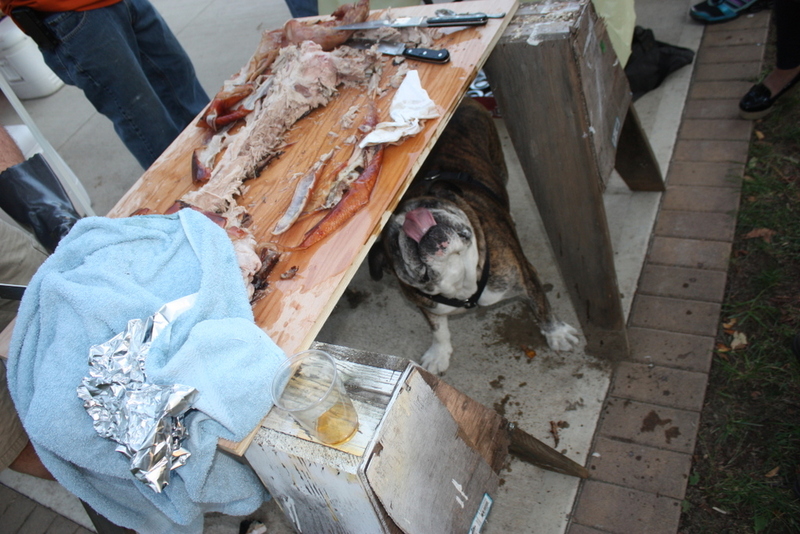 ), I had also sparked the idea in his head that we should host a joint pig roast. He volunteered his backyard, and that was that. After months of procrastination, we finally settled on an early fall date, and the first (of what we hope to be an annual tradition) “Fall Pig Roast and Bourbon Sip” was born. The first issue was how we were going to cook the beast. 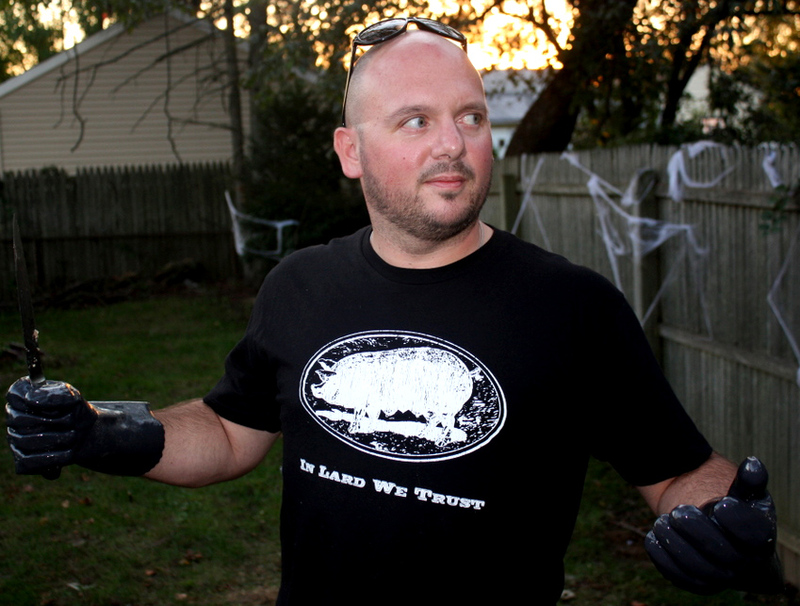 @mikeypiro had just re-seeded his yard, so we were not going to dig a pit in the ground. We have toddlers and small children of different ages, so a rotisserie was pretty much out of the question for two main reasons; an open fire in the backyard, and having to explain to kids who are just getting in to Peppa Pig and Olivia that we are eating their cousin. We settled on a roasting box. There are a number of boxes on the market, but why buy one, when you have access to a bitchin’ set of tools and the talents of @mikeypiro and his pops? I won’t get too much in to the construction of the box (hopefully I can convince @mikeypiro to write a guest post about it), but it’s basically a wooden box, with a stainless-steel lined interior. 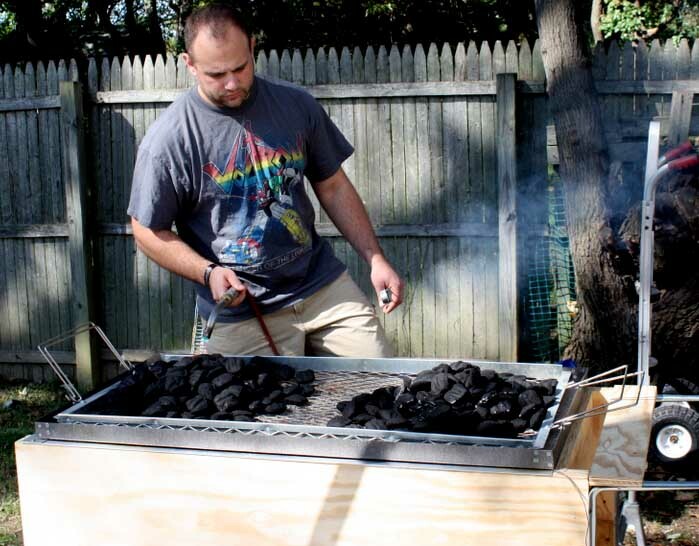 Pig goes in the box, hot coals go on top, after a while you flip, and in a few hours you have a perfect roasted piggy. Some people call it a “Cajun microwave”. I just called it awesome. 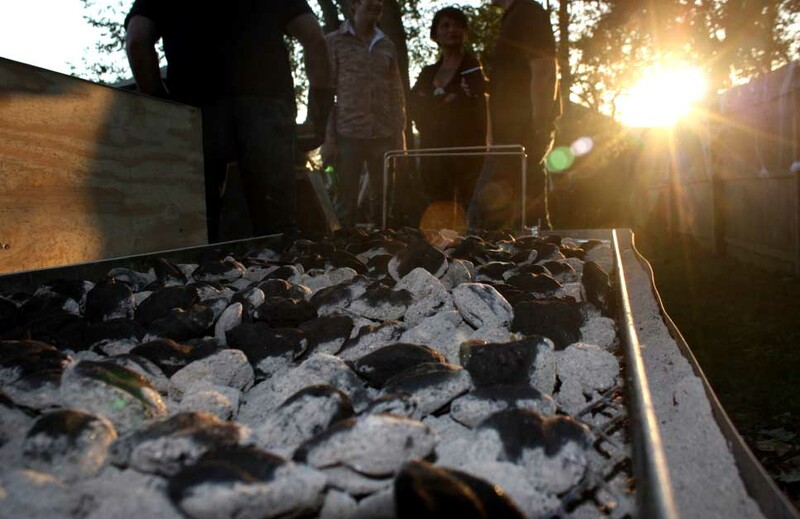 How do you get your coals nice and hot without using lighter fluid? Blowtorch of course! I called up my friends at Ottomanelli & Sons Prime Meats a week before the roast to confirm that they could get the pig. Of course they could. Raw pork belly for making bacon? Yup! I showed up as instructed, and the piggy was mine for the taking. We opted for a 40lb beast (after cleaning), figuring we’d have around 30 people at the party. I am a HUGE believer in brining. Turkey and chicken are great after a few hours in salty, herbed water, but pork takes to brine like a fish to (salt) water. After picking up porky the morning before the roast, the next step was to make a brine. Since this was a “Fall Pig Roast” I decided on autumnal flavors. I made the brine out of apple cider, salt and water. In the brine I put sage, thyme, loads of garlic, a few chopped onions, and a bit of crushed red pepper. I used Ruhlman’s Ratio app (which is an indispensable kitchen tool in my opinion) to come up with the proper amounts. Then came the fun part; lifting a 40lb pig, by myself, into a lawn and leaf bag where it would sit in the brine for 24 hours to soak up all of the flavors. I really hope the neighbors were watching because it was a proud moment for me… lifting piggy by the feet out of the cooler with one hand, propping it on my forearm as I opened the bag, and then putting it all back in the cooler in one swift action. I am the pig brine king!!! I don’t really know what to say about this, other than it was a lot easier and tastier than I was expecting. The roasting box method only takes a few hours. 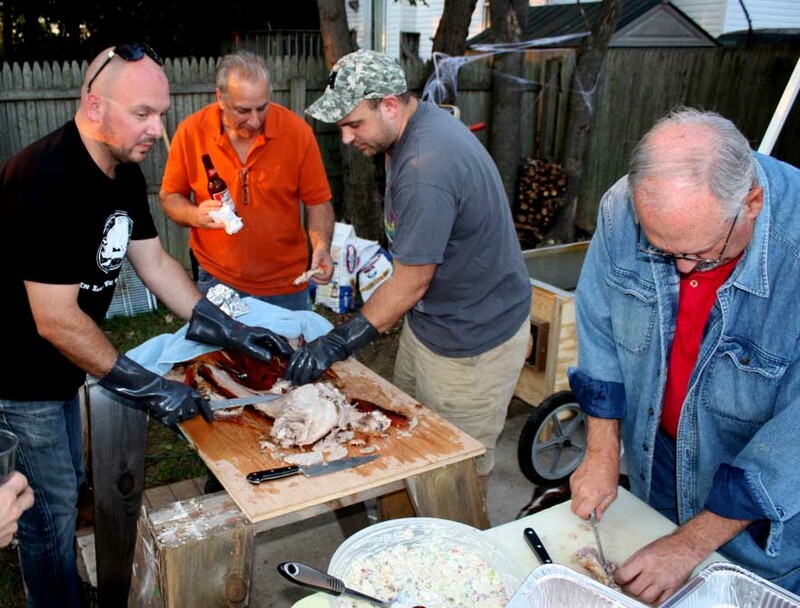 The whole pig was done, from igniting of the coals to the crisping of the skin, in under four hours. One partygoer had the astute observation, that whenever a pit of fire is around, the men congregate around it. It’s primal instinct. This was evident in the unprompted carving assembly line that formed when piggy was released from the fire. Mikey and I took care of liberating the delicious meat from the bones, and handed the chunks off to the onlookers who sliced it in to bite sized portions. The meat was juicy and DEFINITELY had the flavors from the brine. There were hints of the herbs, and one of the most pleasant surprises were the sage leaves that had stuck to the pig’s skin and had fried up in the pork fat. I wish we could market these (sage / pork chips?). Another piece that everyone agreed was amazing was the tongue. I removed it and sliced it as thin as I could. There was not enough of it to go around! This was definitely a fun experience. Both Mikey and I agreed that we are going do it again next year. We loved the communal aspect of it all. 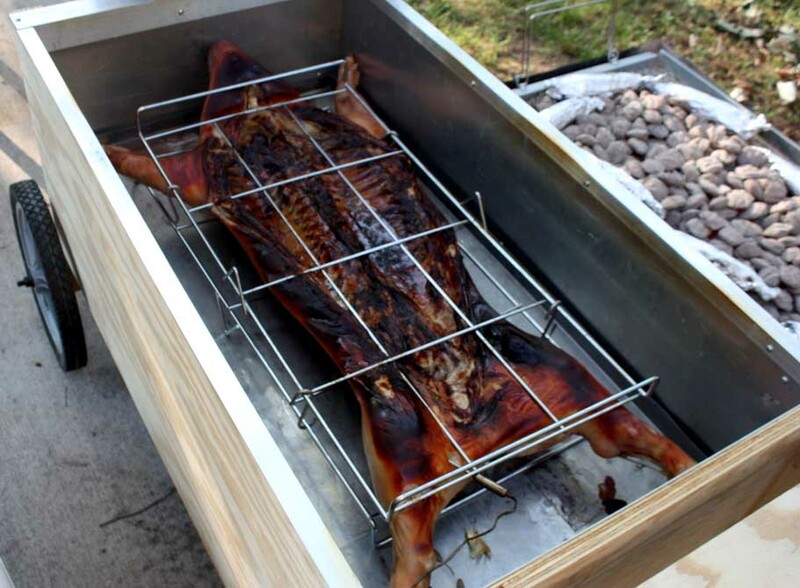 We sent out an invite saying that we were roasting a pig and all of a sudden we were inundated with calls, text messages, and emails about what other people wanted to bring. The hosts enjoying a celebratory leg. Complete with gloves from the set of the movie "Hostel"
The side dishes that I made will have blog posts of their own some day. Both the Sriracha deviled eggs and bacon baked beans that I made were big hits. There was home made coleslaw, horseradish potato salad, cold pasta salad, pumpkin pie, lemon cookies, crumb cake, and mini carrot cake cupcakes. To wash it all down (aside from the mass quantities of bourbon available), I cooked up a batch of spiced apple cider that tasted like liquified apple pie. The wheels are already spinning for next year’s event. I’m thinking fire eaters, stilt walkers, and a daredevil motorcycle act. If you would like to attend, leave a comment below and I’ll consider adding you to the guest list. Bribes can be made payable to me via PayPal, or gift certificates to Ottomanelli’s. Excuse me now, I need to go run 3 or 4 consecutive marathons to help work off the effects of this past weekend. While I do that, you can look at a few more piggy pics. The name of my next band- "Bourbon and Machetes"
I still don’t want to look at porky’s teeth, eyes, or anything that makes it somewhat personable, but much respect all around!!! I have some kidneys in the fridge. Should I bring them in to work this week? Fuglybronco? That has to be Turbo, right? Not bad for a city boy, eh? Wow! I’m a little squeamish around meat in its original form but you had me fascinated the whole read. Great job! Thanks for the comment. A fun time was had by all that day and it was just as much fun to write about it! I think we left your house a week too early. Grandma Diane, you are always welcome! Dude, the brine was so key! Great work! My take away(s): more coal tended often, thermometer goes into the head next time, BIGGER PIG! I have a bit of leftovers, but not much. It was a great feast. Wow. I am so impressed (as is Doug) with the fact you guys built your own roasting box. Sounds awesome! 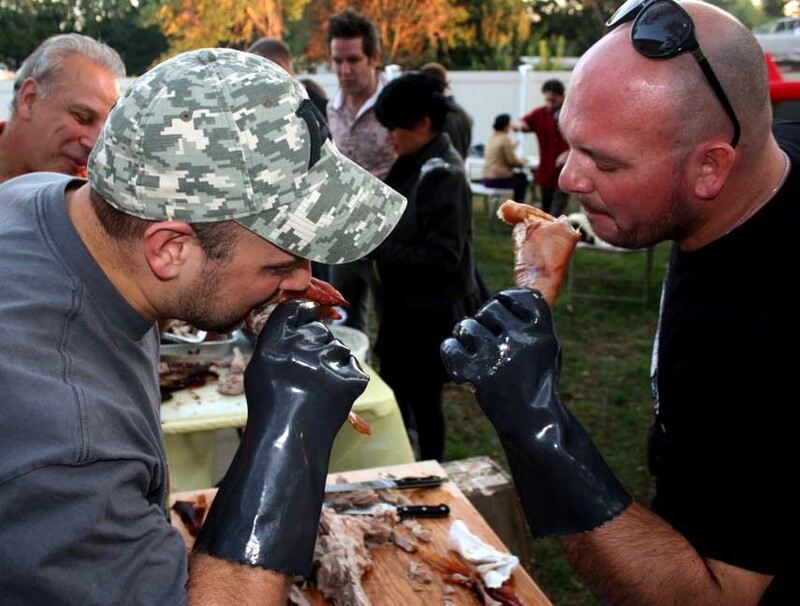 I love the photos and I love the enthusiasm and attention to detail when anything concerning meat is involved. I would love to hear specs on the box – and if we are lucky, maybe we’ll have some elk or venison to contribute to an event next fall! Hmmmmm. Mikey, do you see this? I think we can arrange a trade. Blueprints for wild game. Oh Alright…. 🙂 I can put together a post on DIY roasting box complete with dimensions, what we ordered from where etc. Tom Great Post! The whole experience was a blast! Couple of quick take away points so we can remember for next year: Charcoal needs to be added and tended often. Thermometer should go in the head/ neck area. The Brine was killer, that recipe should be in a fireproof safe. 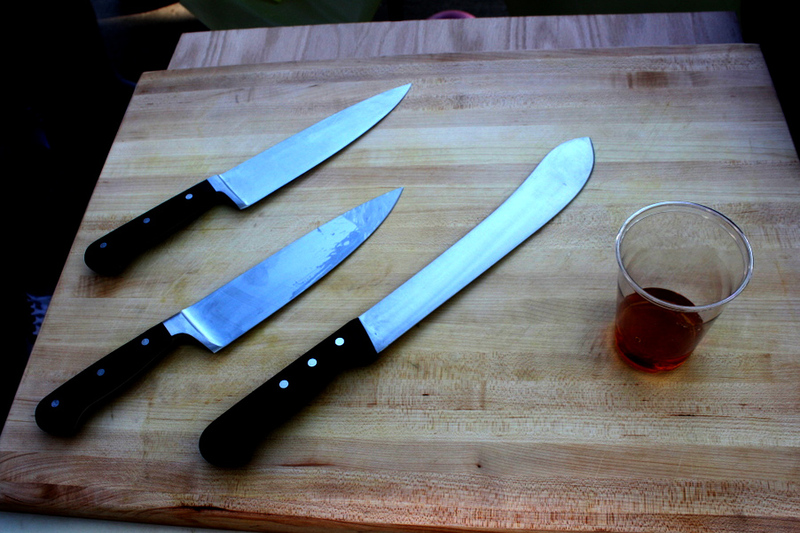 We will build a better cutting board, my dog licking up the juice was a bit of a buzz kill for me… @Anferno did a killer job documenting. Next year, since we are past the whole “1st annual” we are making t-shirts…. Again, great job!